Elly has been invited to a fancy dress party. She wants to go as a witch and decides to start with the hat. Choose one of the hats shown here, or design your own. What shapes would you need to cut out to make it? 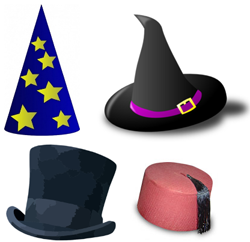 If you're not sure how to make a witch's hat, you could start with a top hat or a fez, and then see how you need to adapt them to make a witch's hat. You could start by drawing the shapes you think she might need on squared paper, then cut them out to see if they fold into the right sort of hat. Sellotape will do at this stage to stick your hat together. When you're happy with your design, try making it with paper, card or fabric. If you use A4 or A3 paper, try different ways of laying out the pieces you want on the paper. What is the tallest witch's hat you can make from a sheet of A3 paper? If you wanted to make the tallest hat possible from your A3 paper, would you choose to make a witch's hat, a wizard's hat, a top hat or a fez? How much difference does having a brim make? 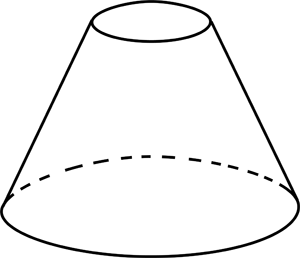 The fez could be modelled as a cylinder or as the frustum of a cone. How does this change the maximum possible height? Images in the public domain, and taken from Clker.com and Wikimedia Commons (the fez). Maths Supporting SET. Practical Activity. Angles - points, lines and parallel lines. Mathematical modelling. Investigations. Spheres, cylinders & cones. Nets. 2D shapes and their properties. Textiles. Design.